For some families, the laundry room is a magical place where dirty clothes go to be miraculously washed and folded – seemingly all by themselves. Moms know better. Your laundry room is the work horse of the home; it’s where stuff gets done. You need a floor that can stand up to water and dirt and soap. But you don’t want to feel like you’re in a solitary bunker where no one ventures except to drop of more dirty laundry. After all, you spend way too much time there already. Number one is sheet vinyl, LVT, WPC or even rigid core, these floors are one of the preferred floors wherever moisture is present; some are even waterproof. Vinyl floors can take it. They’re easy to clean, easy to look at with lots of styling options, and they have a little bit of “give” underfoot you’ll appreciate when you find yourself spending more time in front of the washing machine than you expected. You certainly won’t have to give up style and design to have a functional yet Beautiful Floor. With realistic visuals that mimic stone, ceramic tile and hardwood, you can have any “look” you want. 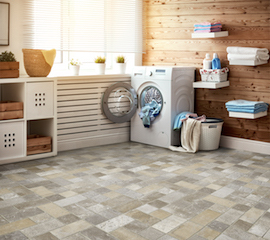 Another work horse floor, ceramic tile can handle anything a laundry room can throw at it. Ceramic can get pricey but there are lower-end and less expensive products that will perform quite well so you won’t have to spend a fortune. Lay the floor in interesting patterns and even inexpensive ceramic can look like a million bucks. 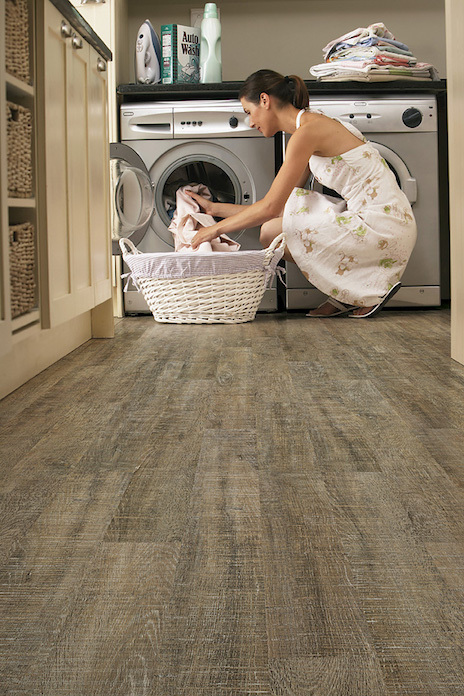 With moisture resistant properties and the ability to completely seal off the floor for a waterproof installation, some people are using laminate in laundry rooms. And certainly, these floors technically can work for this space. Unless you opt for moisture protection, I don’t recommend laminate no matter what other precautions you might take. Water and moisture are laminate flooring’s arch enemies. No good can come of it.